The VOR does not account for the aircraft heading. It only relays the aircraft direction from the station and has the same indications regardless of which way the nose is pointing. Tune the VOR receiver to the appropriate frequency of the selected VOR ground station, turn up the audio volume, and identify the station’s signal audibly. Then, rotate the OBS to center the CDI needle and read the course under or over the index. In Figure 9-12, 360° TO is the course indicated, while in Figure 9-15, 180° TO is the course. The latter indicates that the aircraft (which may be heading in any direction) is, at this moment, located at any point on the 360° radial (line from the station) except directly over the station or very close to it, as in Figure 9-15. The CDI deviates from side to side as the aircraft passes over or nearly over the station because of the volume of space above the station where the zone of confusion exists. This zone of confusion is caused by lack of adequate signal directly above the station due to the radiation pattern of the station’s antenna, and because the resultant of the opposing reference and variable signals is small and constantly changing. Figure 9-15. CDI interpretation. The CDI as typically found on analog systems (right) and as found on electronic flight instruments (left). The CDI in Figure 9-15 indicates 180°, meaning that the aircraft is on the 180° or the 360° radial of the station. The TO/ FROM indicator resolves the ambiguity. If the TO indicator is showing, then it is 180° TO the station. The FROM indication indicates the radial of the station the aircraft is presently on. Movement of the CDI from center, if it occurs at a relatively constant rate, indicates the aircraft is moving or drifting off the 180°/360° line. If the movement is rapid or fluctuating, this is an indication of impending station passage (the aircraft is near the station). 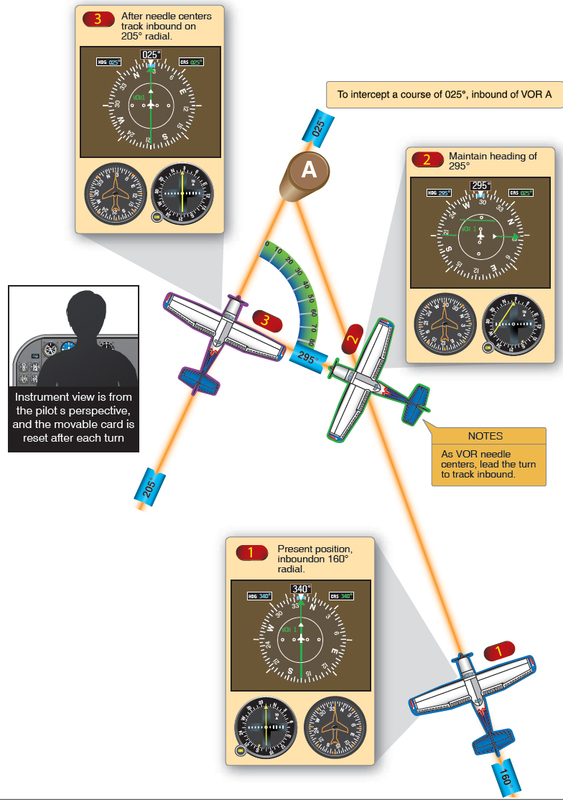 To determine the aircraft’s position relative to the station, rotate the OBS until FROM appears in the window, and then center the CDI needle. The index indicates the VOR radial where the aircraft is located. The inbound (to the station) course is the reciprocal of the radial. If the VOR is set to the reciprocal of the intended course, the CDI reflects reverse sensing. To correct for needle deflection, turn away from the needle. To avoid this reverse sensing situation, set the VOR to agree with the intended course. 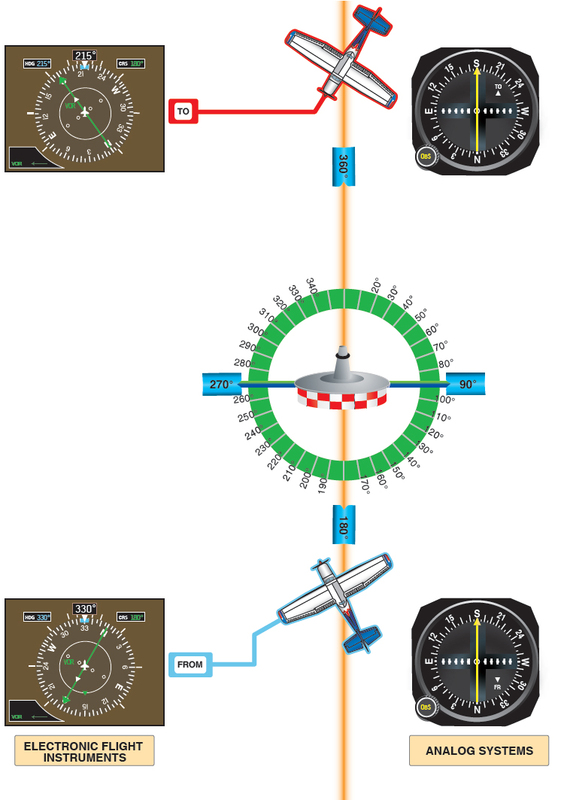 A single NAVAID allows a pilot to determine the aircraft’s position relative to a radial. Indications from a second NAVAID are needed in order to narrow the aircraft’s position down to an exact location on this radial. To track to the station, rotate the OBS until TO appears, then center the CDI. Fly the course indicated by the index. If the CDI moves off center to the left, follow the needle by correcting course to the left, beginning with a 20° correction. When flying the course indicated on the index, a left deflection of the needle indicates a crosswind component from the left. If the amount of correction brings the needle back to center, decrease the left course correction by half. If the CDI moves left or right now, it should do so much more slowly, and smaller heading corrections can be made for the next iteration. Keeping the CDI centered takes the aircraft to the station. To track to the station, the OBS value at the index is not changed. To home to the station, the CDI needle is periodically centered, and the new course under the index is used for the aircraft heading. Homing follows a circuitous route to the station, just as with ADF homing. 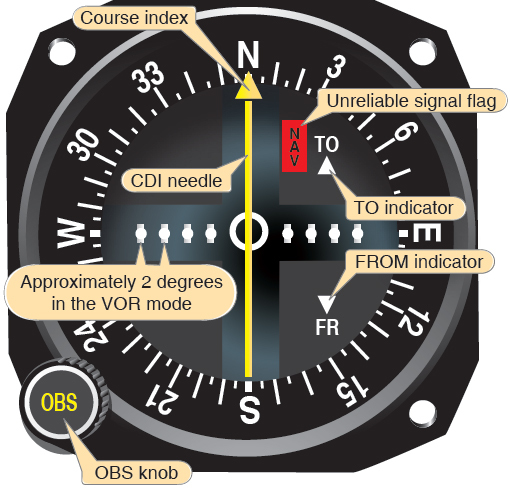 To track FROM the station on a VOR radial, you should first orient the aircraft’s location with respect to the station and the desired outbound track by centering the CDI needle with a FROM indication. The track is intercepted by either flying over the station or establishing an intercept heading. The magnetic course of the desired radial is entered under the index using the OBS and the intercept heading held until the CDI centers. Then the procedure for tracking to the station is used to fly outbound on the specified radial. If the desired course is not the one being flown, first orient the aircraft’s position with respect to the VOR station and the course to be flown, and then establish an intercept heading. The following steps may be used to intercept a predetermined course, either inbound or outbound. Steps 1–3 may be omitted when turning directly to intercept the course without initially turning to parallel the desired course. Determine the difference between the radial to be intercepted and the radial on which the aircraft is located (205° – 160° = 045°). Double the difference to determine the interception angle, which will not be less than 20° nor greater than 90° (45° × 2 = 090°). 205° + 090° = 295° for the intercept). Rotate the OBS to the desired radial or inbound course. Turn to the interception heading. Turn to the MH corresponding to the selected course, and follow tracking procedures inbound or outbound. Course interception is illustrated in Figure 9-16. Careless tuning and identification of station. Failure to check receiver for accuracy/sensitivity. Turning in the wrong direction during an orientation. This error is common until visualizing position rather than heading. Failure to check the ambiguity (TO/FROM) indicator, particularly during course reversals, resulting in reverse sensing and corrections in the wrong direction. Failure to parallel the desired radial on a track interception problem. Without this step, orientation to the desired radial can be confusing. Since pilots think in terms of left and right of course, aligning the aircraft position to the radial/course is essential. Overshooting and undershooting radials on interception problems. Overcontrolling corrections during tracking, especially close to the station. Misinterpretation of station passage. On VOR receivers not equipped with an ON/OFF flag, a voice transmission on the combined communication and navigation radio (NAV/COM) in use for VOR may cause the same TO/FROM fluctuations on the ambiguity meter as shown during station passage. Read the whole receiver—TO/FROM, CDI, and OBS—before you make a decision. Do not utilize a VOR reading observed while transmitting. Chasing the CDI, resulting in homing instead of tracking. Careless heading control and failure to bracket wind corrections make this error common.